VPiX® is proud to offer an affordable IDX system for brokers and agents. Now, you can add thousands of listings, including foreclosures and short sales that are real estate search engine optimization friendly to your existing website. Google map search driven IDX MLS systems are included, as well as a lead manager. Leads can be routed to Top Producer or Outlook. SPECIAL: Now you can add the IDX to your iPhone, iPad or any SmartPhone equipped with an Internet browser. SuperIDX for your website and your SmartPhone is bundled at a very special price for just $795 one time set up for brokers, and $495 for agents. Build your own iDX. 3 Easy Steps. 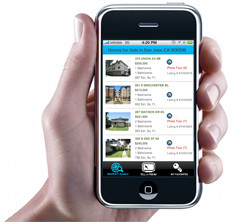 Ventura Barnett Properties creates hot sheets that automatically update listings on their website 3 times a day. Ventura Barnett offers SmartPhone visitors an automatic redirect to their Mobile website with an IDX.